85x85x19mm Door Arc Block - finished sizes. These corner roundels are unfinished timber "in the white" and require fine sanding for decoration. 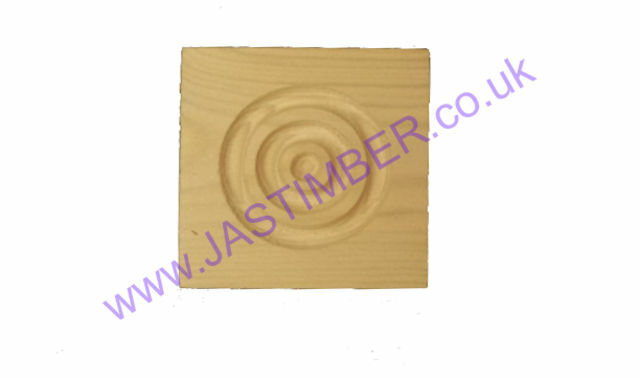 Softwood Architrave Blocks should be treated and fixed in place as soon as possible to help minimise any movement/­twisting and surface checking/­splitting that occurs naturally with changes in moisture content; Redwood Corner Blocks can not be recommended for use externally without suitable timber treatment & maintained weather-proof coating; External use of Architrave Corner Blocks are at your own risk - Timber life expectancy is increased with good timber treatment and maintained finishing coats. It is better to use pressure treated timbers externally. - We cannot exchange any Timber Product once work has commenced. Larger orders, Direct Deliveries and Special Sizes are supplied as a Special Order. E. & O.E. see T&C - We do try to keep prices and specifi­cations correct for Softwood Corner Roundels, but mistakes can be made!